To be said when problems arise or when one seems to be deprived of all visible help, or for cases most despaired of. Most holy apostle, St. Jude, faithful servant and friend of Jesus, the name of the traitor has caused you to be forgotten by many but the Church honors and invokes you universally, as the patron of hopeless cases, of things most despaired of. Pray for me, I am so helpless and alone. Make use I implore you, of that particular privilege given to you, to bring visible and speedy help where help is most despaired of. Come to my assistance in this great need that I may receive the consolation and help of heaven in all my necessities, tribulations, and sufferings, particularly (Here make your request) and that I may praise God with you and all the elect forever. 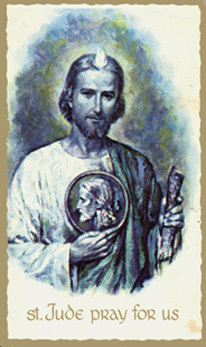 I promise, Oh blessed St. Jude, to be ever mindful of this great favor, to always honor you as my special and powerful patron, and to gratefully encourage devotion to you. Amen. This prayer works if you believe. Please do not send me donations. Send all donations to the national shrine.